Rite in the rain products are excellent for outdoor enthusiasts, camping and backpacking as a provider of writing notepads that can be used without getting damaged by the weather. This kit features a pocket notebook, a pen and a cordura nylon cover, it can be carried in your pocket or in a backpack and will not get damaged by daily use, rain, humidity or sunlight. The notebook is the go-anywhere notebook it has a polydura cover and will be able to write even under water. The notebook has 50 sheets for a total of 100 pages, it does feel a little waxy when writing and it is not recommended for gel ink pens but it will hold very well if used with ballpoint pens. This kit came with a 4'' x 6'' notebook but other sizes are available. The pen is a pressurized ink black metal body pen that will write in all weather conditions, even under water or upside down. It has been tested in very low and very high temperatures and kept writing without any problems. The cover is a cordura nylong strong cover with a zipper closure and slots for four writing utensils.You can keep the zipper open if you are using the notebook and close it to prevent losing your pens when you store it. This kit is available in green, yellow or tan colors and you can choose different sizes and different kinds of notebook refills. Getting soem notebook refills is definitively a good idea. You can read more and order for $22.95EA from Rite in the Rain's website. This is a very small keychain screwdriver featuring both a flat screwdriver and a philips screwdriver in a small presentation. 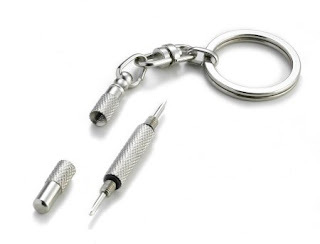 The keychain consists of a strong stailess steel flat-style split ring attached to a chain link that is in turn attached to a stainless steel swivel, the swivel is then attached to a small delta-shaped steel chain link. The link is threaded to a small hole in the top part of the screwdriver. To use it just unscrew the end that you want to use to get either the philips or the flat screwdriver, both of them are small in size, the flat end works well with glasses and can be used as a very small scraping tool or for very light prying. The philips is useful for small philips screws typical in some electronic gadgets. You can remove it from the delta chain link and directly attach it to a split ring for an almost unnoticeable keychain size. The Survivor is a right angle flashlight from streamlight designed as an emergency light for outdoor enthusiasts and hikers and as utility light for rescue personnel and firefighters. The LED version features a 3w luxeon led powered by four AA batteries. The body is a strong polymer in a bright dark orange color (yellow also available) the plastic is resistant to impacts and abrassions, a 30feet drop test is ensured by the manufacturer it is also water proof via orings for sealing. 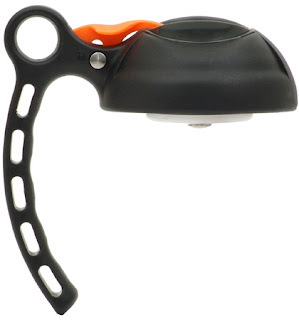 At the back of the body the survivor has a plastic clip to attach the light to a strap, belt or other attachment points, it also has a loop in the clip for extra attachment and carrying options. The switch is at the top and can be operated with gloves, it has 3 modes of operation: High beam, low beam and locator strobe. Just press the switch to change from off to high, then low and off. Press and hold from any mode for the locator strobe. 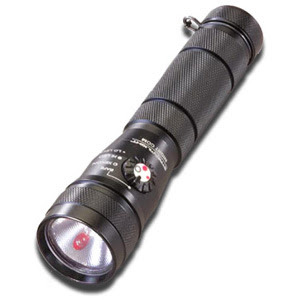 The flashlight has a very deep smooth reflector so it produces a lot of throw, the LED being able to reach very distant objects while keeping a very usable sidespill for close tasks. Without a doubt the light is designed to search for rescuers or to be found by hikers, smoke penetration and fog penetration is very good for a LED light, the incandescent version is as expected a little better in this aspects but without the reliability of the LED. The runtime with four AA batteries is 3 hours in high mode and about 6 hours in low mode lithium batteries can't be used. Changing batteries and operatoin is very easy and can be done with gloves or in a moderate state of shock in case of emergencies. No need for special tools or small button or flaps to press or lift. This is a very interesting right-angled light for hikers and for search and rescue people, designed to be very easy to use and to be visible from long distances with good runtime and 3 useful modes of operation. You can read more from Streamlight's website. And you can order from BrightGuy.com for $111. The Night Com is a hybrid flashlight combining an incandescent Xenon lamp with three 5mm LEDs powered by two C123 lithium batteries. The LEDs are placed around the xenon lamp, two of them can be used as secondary illumination while the third LED is a locator beacon. This model came with red leds and a version with green leds is available. The Night Com is activated by a clickie switch in the back of the flashlight and the mode that the clickie switch activates is selected by a second switch near the head that is a selector with 4 different positions. The positions of this switch are: No light meaning the light is locked and the tailcap switch won't work at all, useful for storage purposes. The second position is Xenon used to activate the incandescent beam. The third position is LED activating two of the 3 LEDs around the bezel. The fourth position is locator used to activate the locator led only, this mode is useful for very dim light in very dark conditions or to be able to find the flashlight in the dark. Runtime is 2 hours for the Xenon lamp, 13 hours for the main leds and 130 hours for the locator led. Following the manufacturer instructions only primary 123 cells should be used and not rechargeables. The beam of the Xenon lamp is very floody because of the textured reflector, this makes the Night Com a light that can be used to illuminate rooms very well but that will not be able to reach distant objects when outside. Given that the LEDs are already good for a task light it would have been better,in our humble opinion, to use a mirror finish deeper reflector for longer throw with the Xenon lamp. The LEDs are good for close tasks and navigation, the red version that will not harm night vision is specially good for astronomy and other activities that require adaptation to the darkness. The locator mode works well for camping or astronomy since you can keep the very dim red led on permanently. The build quality is excellent, and the light feels very solid. It is not too lengthy, but a good size and weight to hold and carry. The included lanyard is handy as well. The Night Com is not perfect, the beam has some artifacts and an oval hotspot, the color rendering tends to be yellowish; but if you have a need for a flashlight that combines an incandescent beam with red or green LEDs you have an affordable light that will work well. If you need more throw and ooomph from the Xenon light, regulation and a stronger construction then the Surefire A2 is certainly better but it costs 5 times the price of the NightCom. You can read more at Streamlight's website. Or order for $36 from Lighthound. 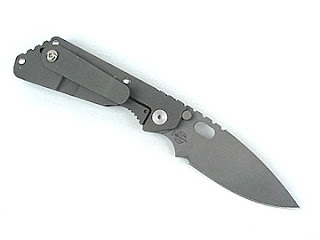 The Strider PT is the smallest folding knife in the Strider family. Regarded by many knife experts as the Ferraris of knives Striders are with or without fanatism among the best knife manufacturing companies and deserve their position. The PT is a 3 ¼” blade with a Titanium frame and checkered G10 scales, the blade is S30v stainless steel with Strider's trademarked special coating featuring the tiger stripes. The lock is a framelock and is probably one of the best framelocks ever built the integral locking tab has the cutout on the outside rather than on the inside so that the stress against the lock is transmitted straight thru the tab without the cutout becoming a point for the lock to bend out of engagement with the back of the blade. The G10 scales offer a very nice grip not slippery at all without being rough on your hands, if you ask me it is more on the rough side than the slippery side and that works for me. The thumbstuds are well placed and proportional for a confortable opening and closing action. The pocket clip is strong and long enough for pocket carry or straps. From the factory the PT is very sharp, the edge holds very well to most normal cutting jobs and it is very easy to sharpen when it gets dull. The PT is as strong as a knife can be with a titanium frame and an S30V blade it is probably indestructible, the lock is completely reliable and without a doubt you can use this little knife for very serious cutting. The knife is indeed expensive but considering the building process that has a lot of custom hand made parts and the final quality we can ensure you are paying from what you get. It is up to a matter of taste about the design if this is the ultimate pocket folder for you or not. You can order for $300 from TAD Gear. The Gription is a replacement lid for a wide-mouth Nalgene Bottle. You unscrew the nalgene cap and screw the Gription and you have some features that were not present in your original bottle. The Gription has an orange button that you can press to open the valve and take sips from your bottle, if you press ligthly the valve will open just a little for a small sip if you press more you will be able to get a good gulp of water. In either open or closed position you can lock the valve sliding the silver lock mechanism, this will let you keep the bottle closed for storage in a leak proof way or opened permanently when you are in constant need of its contents. The Gription has a very large handle that can be used to hold the bottle when drinking and can also be used to clip the bottle to a pocket, backpack or something similar, the handle is long and strong enough to support the weight of the full bottle and the shape makes it specially useful for this dual purpose. Between the lid and the handle you can find a large plastic hole that can be used to attach the bottle to a backpack or a belt loop using a carabiner or something similar. Without doubts the Gription is a must-have companion for your Nalgene Bottle turning a nice water storage bottle into a very nice hydration system. The Glow Mate is a small keychain by Brunton with GID (glow in the dark) material used as the base. It is 1.75'' in diameter and weights less than 0.5oz so it is definitively suitable for a keychain, the attachment point is a small hole at the top that can be used for a split ring or to thread cord. It comes with a brass split ring which is a very nice detail since it is a non magnetic material. The GID base after exposure to sunlight will glow bright for about 30 minutes to an hour and will be visible with a faint glow for many hours. 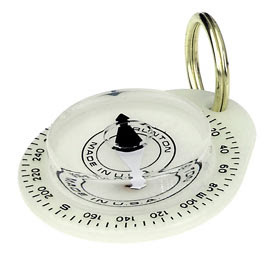 The compass has graduations every 5 degrees and numbers every 20 degrees, magnetic declination can't be adjusted. In a small package the glow mate works very well and is a very nice compass for a keychain and it can be attached to backpacks or used as zipper pull. You can read more and order from Bruton for $8. In the world of water bottles, and there are many, Nalgene bottles have an outstanding reputation among the circle of backpackers and outdoors enthusiasts, in this review we will cover the 32oz wide mouth model, probably the most classic model, but there are many many variations so check which one is best for your needs. The bottle when empty weights 4.5oz it is 7.87 x 3.62 inches in length and comes with a plastic cap with a small plastic loop and a ring around the bottle neck to prevent losing the cap. 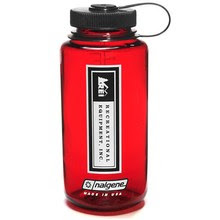 Nalgene bottles are made of Lexan, a special plastic that is very neutral to odors and tastes, probably the best characteristic of the Nalgene bottle is that it won't get soap odor or taste after cleaning it and you can use it for juice and other flavoured drinks without leaving a permanent taste, it doesn't taste like plastic either. Lexan is a bullet proof material so the robustness of the bottle is near the unbelivable, it will resist falls, scratches, bumps and all kinds of abuses without breaking. The bottle can be used to keep boiled water without the Lexan melting at all, the melting point is around the 300F or 154C for Lexan. The wide mouth bottle is leak proof and of course hermetic so it can be filled very easily and that can be very important in a survival situation, it can also be used to store a survival kit or anything that needs to be protected from water and the environment. Bright colored wide mouth Nalgene bottles are an excellent choice for a survival kit doubling as a water container and kit container. The drawback of the wide mouth bottle is that drinking from it can be a bit messy so you can get a Splash Guard for $3.25 to keep the nice properties of the wide mouth without trouble when drinking. In a simple way to start a fire you need to make some tinder burn using sparks or a lighter and then you use the tinder to light up whatever you have for your fire usually dry leaves and wood. The highlight of a magnesium fire starter is that it doesn't need tinder, using magnesium scraps instead. To use it you have to start shaving magnesium scraps from the magnesium bar, using a knive or a similar tool, once you have a small pile of shaves you use a flint on the side of the magnesium bar and strike it with the back of a knife or a similar object to create sparks, the sparks light up the magnesium shaves producing a very very hot flame that will be used to start the fire. The small shaves produce a flame of 5400F and are very very combustible, the solid bar is instead fire proof so don't carry the shaves, they are dangerous, carry the whole bar and shave when you need. This tool is very practical when you don't have tinder, the small shaves are very light and will be a problem with some wind you will then need to dig a small hole to protect the little shaves from the wind. The sparking flint can be problematic so a backup sparking device or the always serviceable lighter can be recommendable. The bar commonly measures 3 in. x 11 in. x 1/2 in. and weighs under 2 oz. 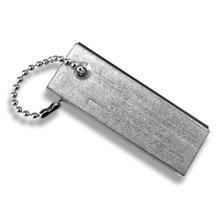 Can be carried in a keychain without problems and is weather proof if wet just let it dry and will be as usable as new. You can get it from many camping or outdoors retailers and from different brands, we have tested 3 different brands and they were almost exactly the same, magnesium is magnesium after all. You can order online from EDC depot for $4.95.